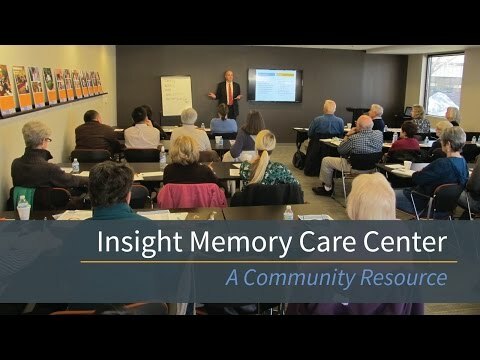 Insight Memory Care Center’s mission is to provide specialized care, support, and education for individuals with Alzheimer's disease and other memory impairments, their families, caregivers, and the community, through our adult day health and resource center. Insight Memory Care Center, formerly Alzheimer’s Family Day Center, is a non-profit organization providing direct care and support for individuals with Alzheimer’s disease, or a related dementia, and their family caregivers. Established in 1984, IMCC’s goal is to help individuals with various forms of memory impairment remain at home, in a quality environment with family and friends for as long as possible. The organization’s day health center provides daily care, socialization, and meaningful activity for those with Alzheimer’s disease and related illnesses. In addition, to help with the often overwhelming job of caregiving, we provide education programs, support groups, and individual consultation for family members. The adult day health center is IMCC’s core program. The day center provides a range of high-quality, therapeutic, and socially stimulating activities for adults with Alzheimer’s disease or related dementias, while simultaneously offering much-needed respite for family caregivers. The program operates from 7:30 a.m. to 5:30 p.m. Monday through Friday, and serves up to 60 participants per day. The day center provides a 1 – 4 staff to participant ratio, exceeding licensure requirements. The program has served over 1,500 participants throughout our 30 plus year history. The day center provides a safe and secure environment that focuses on people’s strengths rather than their memory limitations, addressing the health needs of the total person: physical, mental, and emotional. Innovative approaches are put into practice, from physical therapy and Tai Chi-inspired exercises to art or music therapy and field trips, as these lifestyle and cognitive activities have shown that they can delay the progression of the disease. Breakfast, lunch and two snacks are served each day. IMCC is the only program in Northern Virginia to offer day services to persons with advanced dementia. For these individuals, staff provides total care, including assistance with mealtime, personal care and mobility. Each participant’s care is guided by an individual Care Plan developed by a professional staff team. In effort to provide service to anyone in need, the organization has awarded over $197,000 in financial assistance to 25 participants for FY16. IMCC raises funds specifically for this purpose. For those not yet ready for the day center, IMCC offers two programs for those in the early stages of a memory impairment: The Mind and Body Workshop and our Reconnections program. Reconnections is a weekly gathering of individuals who have mild cognitive impairment or who are in the early stages of dementia. Together with professional staff, a small group of club members participate in individualized discussion groups, recreational activities, learning experiences, and all have the opportunity for peer support and to socialize in a safe, non-judgmental setting. IMCC currently offers three sessions per week at our Fairfax location. The Mind and Body Workshop is a weekly couples group that provides innovative interventions for people recently diagnosed with Alzheimer’s disease or other dementias, and support and training for the caregiver. The program is aimed at helping memory, coping skills, word finding in conversation, and problem solving skills. For family caregivers, a total of 88 free education classes were provided in FY16, a 29% increase in programs from the previous year. Topics ranging from dealing with difficult behaviors to legal and financial planning. In addition, IMCC offers its own unique publication, “Caregiving at a Glance,” which provides strategies for managing behavior challenges and planning for future care. Over 4,000 have been distributed in the community free of charge. IMCC also offers several support group meetings for caregivers that are free of charge and open to the general community. All of these groups help to reduce the sense of isolation many caregivers feel and offer a forum for sharing information and suggestions concerning caregiving. On January 12, 2015, we opened the doors at our brand new 15,000 square foot facility on Pender Drive in Fairfax. The state-of-the-art facility has expanded the capacity of all of our programs and services, including: increased adult day health center capacity from 40 to 60 participants, providing an open floor plan conducive to wandering with no dead ends, offering dedicated spaces for art therapy, physical therapy, Music and Memory, a Multi-Sensory room, and 1,000 square feet of outdoor space, dedicated, separate space for early stage programming, and increased support and education programs. In October 2013, IMCC was honored to be recognized as the Adult Day Center of the Year from the National Adult Day Services Association. This national award is given to one outstanding and innovative adult day center each year, recognized as “best practice.” IMCC was also named one of the best small charities in the Washington Region by the Catalogue for Philanthropy for 2014/2015; a distinction also received in 2010 and 2006. Additionally, IMCC was granted a 2012 Top-Rated Award by GreatNonprofits, a leading provider of user reviews about nonprofit organizations, with all 5-star reviews coming from IMCC’s own supporters. Most importantly, we maintain high standards in providing care for individuals with Alzheimer’s disease and their caregivers. IMCC holds a three-year license, the highest level in Virginia. Our past four annual inspection visits have been completely deficiency-free. We strive to consistently exceed licensure requirements; for example, while state licensure requires a 6 to 1 ratio of participants to staff, IMCC maintains a 4 to 1 ratio in an effort to provide optimum, individualized care for our day health center participants.